The Relative Strength Index (RSI) is a financial technical analysis oscillator showing price strength by comparing upward and downward close-to-close movements. The RSI is popular because it is relatively easy to interpret. It was developed by J. Welles Wilder and published in Commodities magazine (now called Futures magazine) in June 1978, and in his New Concepts in Technical Trading Systems the same year. Note: "Losses" are reported as positive values. Using 70 and 30 as overbought and oversold levels respectively. Generally, if the RSI rises above 30 it is considered bullish for the underlying stock. Conversely, if the RSI falls below 70, it is a bearish signal. Buy and sell signals can also be generated by looking for positive and negative divergences between the RSI and the underlying stock. For example, consider a falling stock whose RSI rises from a low point back up to a high point. Because of how the RSI is calculated, the underlying stock will often reverse its direction soon after such a divergence. 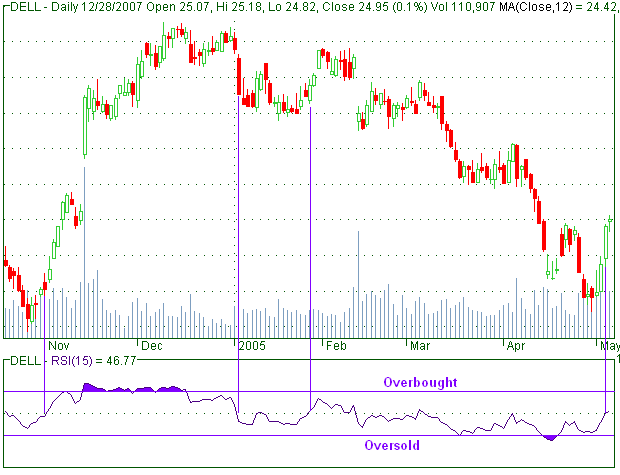 As in that example, divergences that occur after an overbought or oversold reading usually provide more reliable signals. Go long on a positive divergence where the first trough is below 30. Go short on a negative divergence where the first peak is above 70.